The concept of a peptidomimetic was coined about forty years ago. Since then, enormous effort and interest have been devoted to mimic the properties of peptides with small molecules or pseudopeptides. The present report aims to review different approaches described in the past to succeed in this goal. 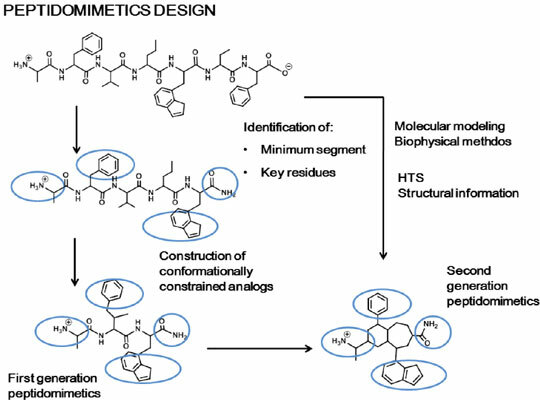 Basically, there are two different approaches to design peptidomimetics: a medicinal chemistry approach, where parts of the peptide are successively replaced by non-peptide moieties until getting a non-peptide molecule and a biophysical approach, where a hypothesis of the bioactive form of the peptide is sketched and peptidomimetics are designed based on hanging the appropriate chemical moieties on diverse scaffolds. Although both approaches have been used in the past, the former has been more widely used to design peptidomimetics of secretory peptides, whereas the latter is nowadays getting momentum with the recent interest in designing protein-protein interaction inhibitors. The present report summarizes the relevance of the information gathered from structure-activity studies, together with a short review of the strategies used to design new peptide analogs and surrogates. In the following section, there is a short discussion on the characterization of the bioactive conformation of a peptide, to continue describing the process of designing conformationally constrained analogs producing first and second generation peptidomimetics. Finally, there is a section devoted to reviewing the use of organic scaffolds to design peptidomimetics based on the information available on the bioactive conformation of the peptide. Keywords: Designing peptidomimetics, medicinal chemistry, molecule, non-peptide, kidney disease, peptides. Keywords:Designing peptidomimetics, medicinal chemistry, molecule, non-peptide, kidney disease, peptides. Abstract:The concept of a peptidomimetic was coined about forty years ago. Since then, enormous effort and interest have been devoted to mimic the properties of peptides with small molecules or pseudopeptides. The present report aims to review different approaches described in the past to succeed in this goal. Basically, there are two different approaches to design peptidomimetics: a medicinal chemistry approach, where parts of the peptide are successively replaced by non-peptide moieties until getting a non-peptide molecule and a biophysical approach, where a hypothesis of the bioactive form of the peptide is sketched and peptidomimetics are designed based on hanging the appropriate chemical moieties on diverse scaffolds. Although both approaches have been used in the past, the former has been more widely used to design peptidomimetics of secretory peptides, whereas the latter is nowadays getting momentum with the recent interest in designing protein-protein interaction inhibitors. The present report summarizes the relevance of the information gathered from structure-activity studies, together with a short review of the strategies used to design new peptide analogs and surrogates. In the following section, there is a short discussion on the characterization of the bioactive conformation of a peptide, to continue describing the process of designing conformationally constrained analogs producing first and second generation peptidomimetics. Finally, there is a section devoted to reviewing the use of organic scaffolds to design peptidomimetics based on the information available on the bioactive conformation of the peptide.